Biography: Shakuhachi and Zen played a big part in my own faith journey. They helped me learn to listen during prayer, and to approach life with trust instead of fear, embracing mystery and being content even when understanding doesn’t come. I appreciate the more introverted and personal nature of older shakuhachi, as opposed to the more performance-friendly construction of modern jinashi and jiari flutes. 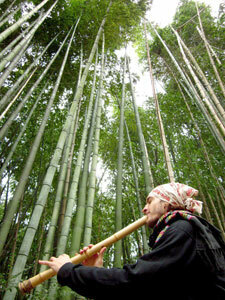 I began exploring how to make shakuhachi that lend themselves better to meditation and prayer in 2012. After studying older techniques (and visiting the new as well) with many different teachers, and a good deal of experimentation, I finally arrived at something that I really like. As for credentials, for whatever they’re worth: I have been playing shakuhachi since 1999, and hold kaiden (Myoan license) from Suiko Takahashi, who also got me started on making shakuhachi. I teach Myoan-ryu and Kinpu-ryu via skype and in person here in Hirosaki, and have also been speaking and holding seminars / concerts in the US and here in Japan to expose people to the meditative side of shakuhachi since 2005. Biography: I am a sculptor and a flute player. I started to make shakuhachi simply because I wanted to play one and it was too expensive for me to buy one. Initially I started to build them for friends and afterwards I began selling them. I also make other flutes like Bansuri, Nay, Native American flutes and others. Flute is my infinite passion. 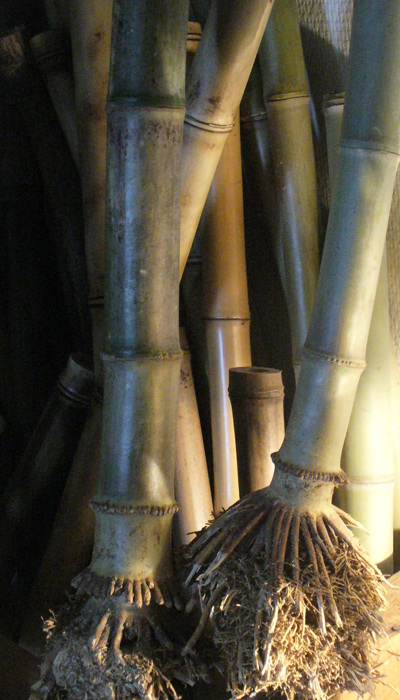 Type of shakuhachi made: Bamboo and wooden of any length. Six and seven hole and Celtic for those wonderful Irish melodies. Biography: I have made over 1000 shakuhachi in 35 years and sent them to 34 countries. Only two have been returned and these have been damaged. Self taught over a long period of time, but much advice given by very good players. Riley Lee is my teacher and without his help it would have been impossible. My aim in making a shakuhachi is function and beauty. It has to look great and do everything required of a shakuhachi. Wooden flutes are guaranteed against cracking. I have used over 100 varieties of timber and found no change in accoustic qualities. Biography: I started making ethnic instruments from the age of 14; four years ago I discovered the shakuhachi, through classes Karate and Kobudo, Shaorin-Ryu style of Okinawa, so I started to make hocchiku of Arundo Donax and Phyllostaquys Nigra, Madake after; using synthetic lacquers; currently use natural resins and lacquers;and urushi also on request the hocchiku ji-nashi shakuhachi and nobekan I make without a prior order, but the flute ji-ari request only done as desired, from 1.6 to 3.1 shaku. My work is 100% handmade, not use machinery, personal philosophical considerations; of course flutes plastic or PVC is strictly prohibited in my dojo! My teacher was inspiring Watazumi-do, and I want to continue the tradition of Japanese bamboo flute, it will remain when we are gone! Biography: I am a predominately self-taught Shakuhachi maker who thanks many who have given me advice. 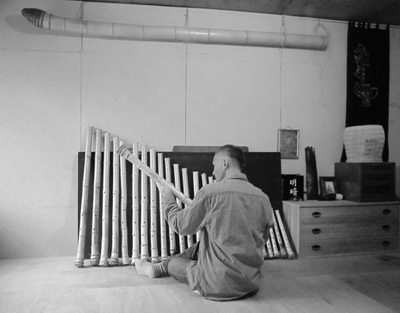 I am also blind and this has meant my Shakuhachi have been made using methods that allow me to complete this task. I use two bamboo species that grow on my own property, ‘Black’, which is actually shades of green that change into shades of brown when dry. And ‘Madake’ which is a light tan when dry. The ‘Black’ Shakuhachi are generally a lighter weight than the ‘Madake’. Growing the bamboo myself allows me to observe the bamboo growth over the years required to obtain a culm useable for Shakuhachi. My flutes are all ‘one-piece’ cut to end on a polished node. Many are matched to particular Keys but many also do not fit a Key, being simply tuned to themselves. I do not insert a Utaguchi but shape and polish the bamboo with a shallow edge. After completion the bamboo is oiled with walnut oil and cured. My general range is 1.6 to 2.4 shaku. Biography: After 10 years of different bamboo flutes making and shakuhachi since 2009, I decided in 2014 to center my work on just a few instruments in which shakuhachi is the one I am dedicated to. 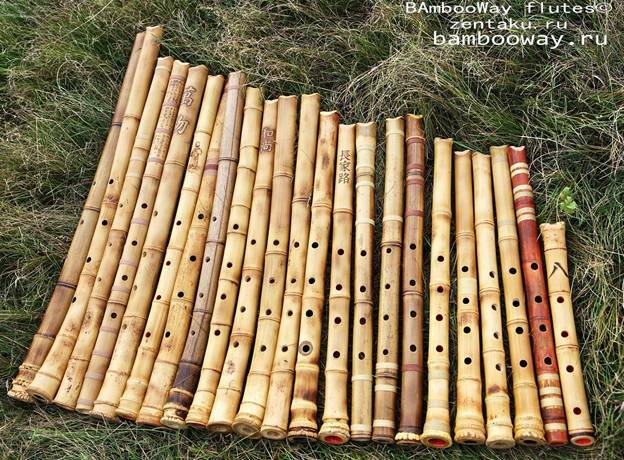 It’s a long and humble way to learn how to make good shakuhachi; Like the process of harvesting, curing and turning a piece of bamboo into such a rich musical and spiritual instrument. but I had been making shakuhachi for over a decade before that. 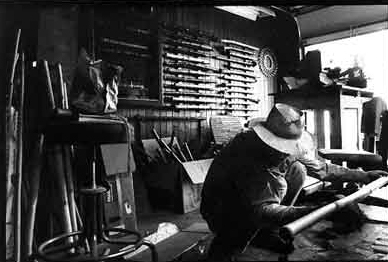 Biography: In 1995, I began an extensive apprenticeship with master flute maker Monty Levenson of Tai Hei Shakuhachi. I branched off on my own and opened Hosetsu Shakuhachi in 2006 with encouragement from Monty. 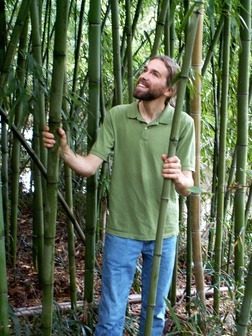 I now live near Celo, NC where bamboo grows wild and I am able to work with the flute from harvesting the bamboo to the final polish. Type of shakuhachi made: I make jinashi shakuhachi and larger more modern hocchiku type jinashi shakuhachi. 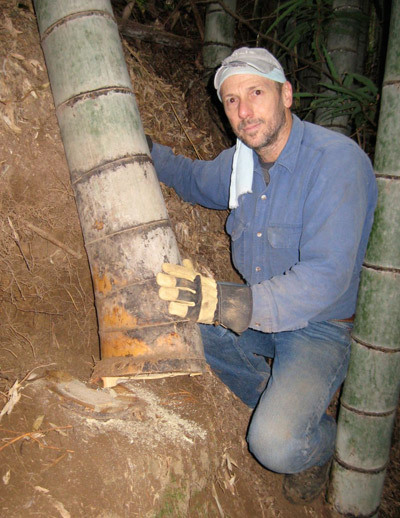 I do not use lacquers, inlays or oils on any of my jinashi shakuhachi and I harvest all of my own Japanese madake bamboo. 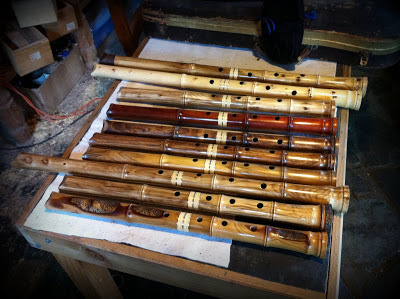 I make shakuhachi that range from highly tuned “modern” players to older komuso Edo period style players. Biography: I started making various bamboo flutes at the age of seventeen and at age nineteen in 2006 I moved to New York City to study shakuhachi music full-time in the Jin Nyodo style. When I reached the end of the Jin Nyodo repertoire I decided that I wanted to learn the original versions of the honkyoku pieces which he and other masters edited to form their styles. I was able to begin studying these pieces under Justin Senryu in 2011. I continue to learn and teach the various regional styles of honkyoku that I learn from Justin. 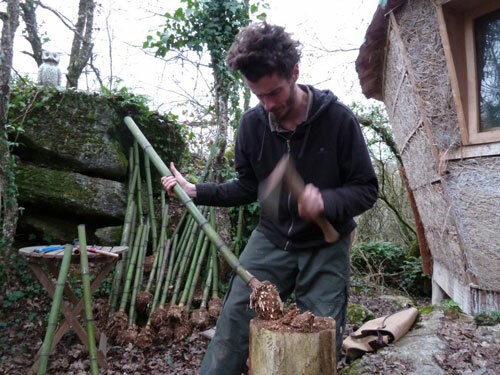 As for shakuhachi making I am pioneering the use of Japanese Madake bamboo (Phyllostachys Bambusoides) growing in The US which I personally harvest from established groves. In 2009 I found my first grove of madake in The US. In the winter of 2011 I harvested from some of the oldest madake groves in America. In 2013 I made the first ever plastic replica of a bamboo jinashi shakuhachi which I named The Bell. Biography: As it was said about one of characters from a well-known fairy-tale about The Moomins, if I am not mistaken, it is Snufkin “no one knows where and when he was born, but the harmonica was always with him”. As for me, everything is the same, only the instrument differs, in my case it is flutes. Speaking seriously, of course I learnt and am continuing to learn from many people, masters. However, they are not all Shakuhachi masters, they may be absolutely various people, and not only people…I consider Georgy Mnatsakanov and Dmitry Kalinin, best Shakuhachi and Hocchiku players in Russia to be my teachers. The main important thing is the process of instrument creation and everything which is connected with it. It is always something new, fresh, and unexpected. Biography: Tai Hei Shakuhachi are made by Monty H. Levenson who maintains workshops at his home in the hills of Mendocino County, California as well as in Japan at the small farming village of Kitagawa (Tokushima Prefecture) on Shikoku Island. 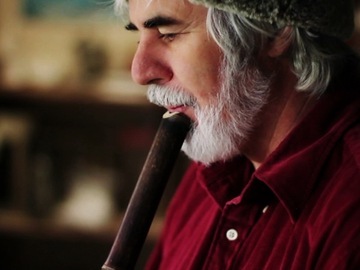 Monty has been making shakuhachi continuously since 1970 and has produced over 7,500 instruments to date. In 1984, Monty developed the precision cast bore technology which enabled him to create affordable, high-quality shakuhachi made of bamboo. 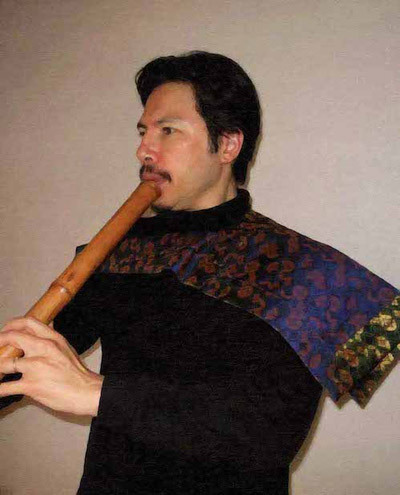 Tai Hei Shakuhachi are now being used by traditional teachers in Japan for their students and professional musicians worldwide as their personal instruments. Since it’s inception twenty-five years ago, the precision cast bore technology has been widely emulated by makers throughout the world. In 1992, Monty trained the master craftsman Masuda Shuho in this process and helped to retool his workshop in Kawasaki, Japan. This partnership was cut short by Masuda’s untimely passing in 2000. While self-taught as a maker, Monty Levenson has collaborated extensively with many prominent players and craftsmen. He works closely with John Kaizan Neptune whose pioneering research into the acoustical physics of the shakuhachi has been incorporated into the precision cast bore and jinashi flutes he makes. Monty has also learned all aspects of harvesting and curing madaké bamboo from Nakamura Ginetsu who has been making shakuhachi in Osaka for over 40 years and is an authority on the subject. He has also teamed up with Roderic Cameron, one of the world’s premiere makers of European Baroque flutes, to develop technologies related to the replication of historical and modern instruments. These endeavors have resulted in a unique laser tracking lathe as well as a computer interface for measuring interior bore profiles with the utmost accuracy. 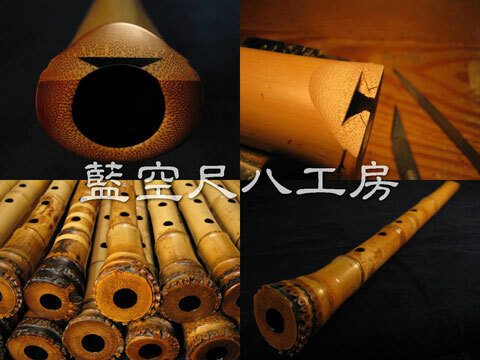 2002 witnessed a number of breakthroughs at Tai Hei Shakuhachi including the manufacture of jinashikan – long, natural bore instruments – and the Shakulute or shakuhachi headjoint for the silver flute. In 2004, Tai Hei Shakuhachi Publishing was officially launched with the aim of preserving and expanding access to information outside of Japan on shakuhachi craft work and the honkyoku tradition. Several books, CDs and videos are currently available. Biography: John Kaizan Neptune brings to the shakuhachi (bamboo flute) a new and dynamic sound and feeling entirely his own. A California-born American, Neptune received his master’s certificate in the Tozan School of Shakuhachi in 1977, at which time he was awarded the name “Kaizan” (“Sea Mountain”). He is the author of the book SHAKUHACHI, and has performed and recorded in many countries around the world. His second album, BAMBOO, was named Outstanding Record of the Year by the Cultural Affairs Agency of the Japanese Ministry of Education; subsequent albums (23 to date [Jan 2013]) and his concerts throughout Japan, Asia, Australia, America, and Europe have made his original music, from traditional Japanese to contemporary jazz, widely know and loved by people of all ages. Neptune, who is acknowledged to be among the top masters of the instrument in Japan, now lives in Kamogawa, Chiba-ken, where he continues to make, write for and experiment with the instrument he had adopted as his own. Biography: My Shakuhachi name “Rankuu” means “deep blue sky”. I saw it in Tibet in 1994 when I was traveling in Asia and I was very impressed by deep silence with vivid blue sky. Shakuhachi’s sound is also something like that for me. My Shakuhachi teachers are, Kinko style from Ichiro Seki, Myoan and Kinpu style from Kougetsu Maekawa. I graduated from The 46th N.H.K Japanese musical player training school. Biography: New maker, I have discovered the making process with John Kaizan Neptune sensei in August 2013 at the ESS Summer School in Barcelona. So I began to make my own shakuhachi in September 2013. I harvest and choose good bamboo by myself to transform into an instrument: …and will continue to study in future with other maker’s sensei. named kaval-shakuhachi: it’s total chromatic C flute. 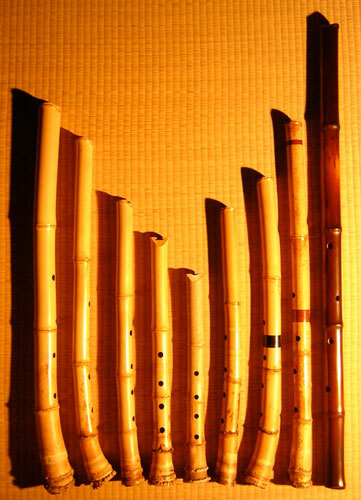 to modern shakuhachi including those made by Takahashi Kûzan. Ôno Ranzan is the first and only non-Japanese who has received the title of Zen Grand Master of the Fuke-shû Shakuhachi (普化宗尺八看主). He raises awareness of the Shakuhachi of the orthodox school by performing recitals and lectures and is teaching his art in Japan and Europe. Perfectly bilingual in Japanese, he is also carrying out researches on the history of the Fuke Shakuhachi, and has published a thesis about the Great Fuke Sect, its history, philosophy, and musical principals. At the same time, he is making Jinashi Shakuhachi and Hitoyogiri flutes following old and traditional methods. 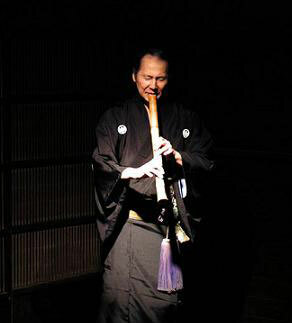 Besides Shakuhachi, Ôno Ranzan is also a renown player of Hitoyogiri. 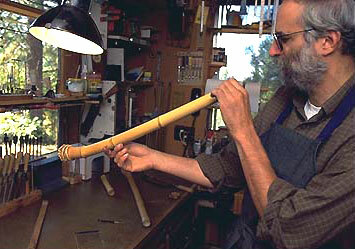 Biography: Shawn began to study the art of making Shakuhachi in 2000. He immersed himself in learning the craftsmanship needed to make Shakuhachi. 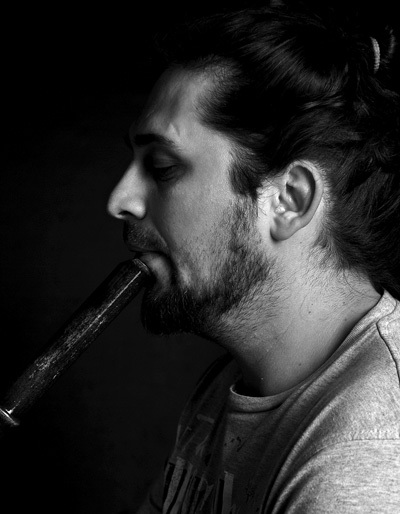 Shawn followed his passion for Shakuhachi by studying and learning to master the art of Shakuhachi making. Shawn has studied with Shakuhachi sensei Kaoru Kakizaki. 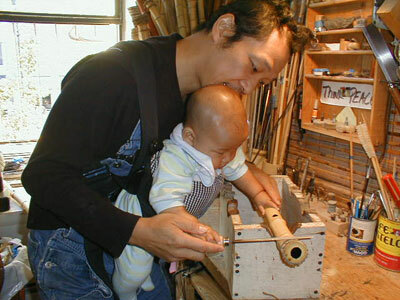 Shawn has also traveled to Japan many times throughout the years to further develop his craftsmanship and Shakuhachi making techniques and skills. Shawn has developed mentorships with sensei’s Takahashi Toyomi, sensei John Kaizen Neptune, Monty Levenson, Tom Deaver, and Shingo Kimura. 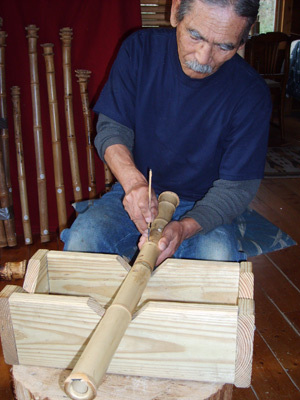 When making Shakuhachi, Shawn’s goals is to craft Shakuhachi as it would be made traditionally in Japan, and to maintain the historical techniques used when making Shakuhachi. Shawn has been able to accomplish this by lessons he’s had in Japan, and times he’s spent working with top makers while in Japan. 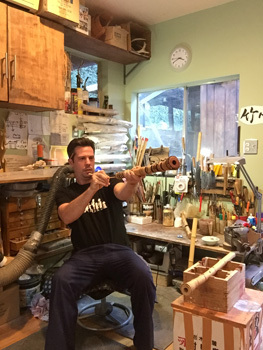 Traditionally, the old-style of traditional Japanese made Shakuhachi has been a well kept secret within a makers lineage, however Shawn has been very fortunate to have people willing to teach him and share their techniques and information with him. This has enabled Shawn to make very high-quality professional level jiari and jinashi Shakuhachi. Biography: The kobo which Dan Shinku is the representative is making a specialty of Ji-nashi Nobekan. Hitoyogiri, Miyogiri and Gagaku shakuhachi as well as Fuke sect of Zen shakuhachi are made. The arts are all made in Japan not only the materials such as Bamboos, Lacquers and Antlers but also the tools. Ji-nashi Nobekans which own the hot, strong and high qualities are indispensable to play making the most use of it. The arts in Kobo Dan Shinku, the player of Classics as well produces are all recorded in CDs or DVDs as the model performance. You can get the superb CDs or DVDs by free of charge if you bought the shakuhachi. 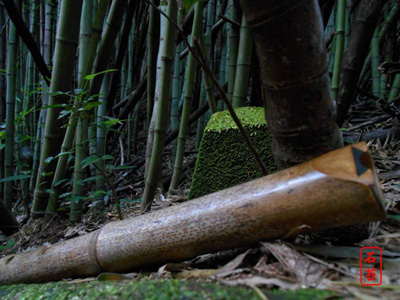 Biography: Ishi Koke shakuhachi are made in Brazil, more precisely in the extreme south. Using local and imported material, our aim is to make shakuhachi capable for the traditional japanese and modern music. Ishi Koke means Stone Moss, or Musgo da Pedra in portuguese. Biography: I practice making shakuhachi – It’s a separate practice than playing for me. It’s my poetry of the wind.) My teacher is Ejun Lechika. Ejun Lechika Rinzai Zen monk is a certified teacher of the Meian (Myoan). My buddhist name is Un Ryuu (雲龍). This name was given to me by my teacher when he was giving me rakusu. I live in the city of Kiev in Ukraine. Biography: Only a handful of shakuhachi made per year, predominantly Kinko jiari, with some restorations of vintage instruments done on occasion. 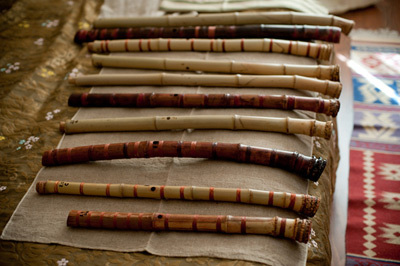 Most are for personal use, though various shakuhachi are frequently offered for sale. Biography: Being a professional musician and guitar player since 1982, I first encountered the shakuhachi in 2004 and took lessons with Antonio Enzan Olías in Madrid for some years. 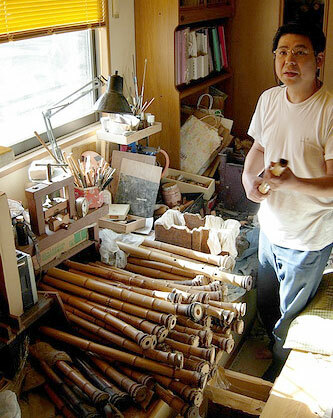 About the same time, I began making shakuhachi and in 2008 and 2009, I travelled to Japan and participated in the jinashi making workshops directed by John Kaizan Neptune at Mejiro, Tokyo and received making lessons from Chiku Za, at his home in Nagano mountains. I also took playing lessons with Tanaka Koumei, Atsuya Okuda, and Chiku Za. After my first travel to Japan, I made some jinashi flutes for Antonio Olías and since then I have been selling flutes regularly. In 2010, I went to Japan again, and also received playing lessons from Etsuzan Fujiyoshi, and Justin Senryu Williams. 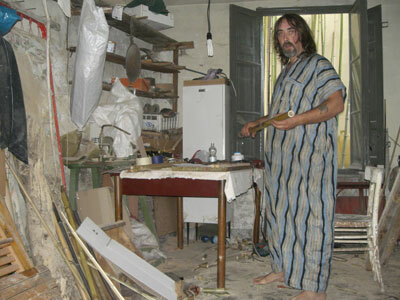 I organized the first jinashi shakuhachi making workshop in Madrid, directed by Chiku Za and assisted him in a workshop at the ESS Shakuhachi Summer School in London 2011, and at another workshop in Madrid in 2012. At the ESS Summer School in Barcelona in 2013, I organized the making workshops directed by John Neptune and helped teaching the basic construction techniques. I only make jinashi flutes and my approach to flute making is very open, trying to find every bamboo’s particular voice. I specialise in making long flutes for normal or even small hands, and lately I am also interested in making very small flutes making which is great fun. Trained in shakuhachi making by: Araki Kodo V, various others. Authorised by Yokoyama Katsuta, Furuya Teruo and Araki Kodo V.
Type of shakuhachi made: Jinashi and jinuri, all lengths. Old style tone colour resulting from years of researching antique shakuhachi. 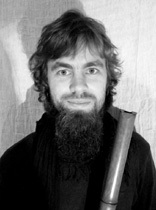 Biography: Justin Senryu lived in Japan from 2005 studying shakuhachi making and playing intensively for 6 years. He received his first Shihan and authorisation as a professional maker from Yokoyama Katsuya and Furuya Teruo in 2007; and his second Shihan from Araki Kodo V, the head teacher of Kinko Ryu, who also awarded him the prestigious makers’ stamp ‘Kodo-sen’ (‘chosen by Kodo’). These teachers, as well as Iwata Seien VI (one of the foremost players of jinashi shakuhachi) have been invaluable to Justin’s shakuhachi making, both in terms of requirements as professional players, as well as subtleties of tone colour. Justin has extensive knowledge of historic shakuhachi, having traveled across Japan examining and playing some of the finest instruments dating back several centuries; been commissioned to restore numerous antique shakuhachi dating back 270 years; and regularly playing the instruments in his personal collection. 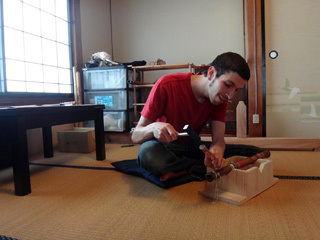 Justin combines his study of shakuhachi making from his teachers with his detailed knowledge of historic instruments, and his study of urushi under makie master Araki Mitsunobu. He makes ji-ari (a.k.a jinuri) shakuhachi primarily following the style of Araki Kodo III, and jinashi shakuhachi primarily following makers such as Araki Chikuo (Ichigetsu-ji temple) and Murase Chikuo (Fudaiji- temple). Biography: In 2002 Perry received the Japan/US Friendship Commission Arts Fellowship (funded by The International House of Japan and the National Endowment for the Arts) enabling him to travel and study traditional shakuhachi crafting and playing in Japan. His main sensei is Kinya Sogawa in the both the Jiari instrument lineage of Chikusen Tamai and Jinashi/Hochiku style of Watazumi. He performs all aspects of professional shakuhachi work – commission, restorations, repairs and customization on existing instruments. 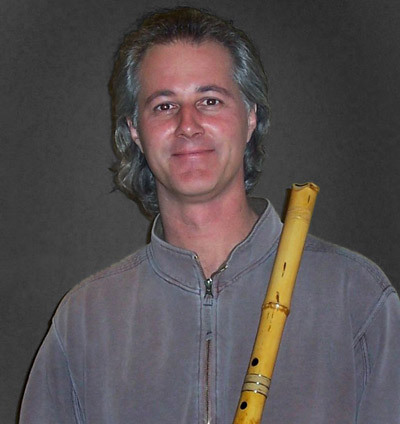 Perry has taught shakuhachi making workshops at shakuhachi camps and colleges and universities throughout the United States. He is the resident shakuhachi making teacher a Zen Mountain Monastery (Mountains and Rivers Order) and Fire Lotus Temple. Shakuhachi teachers: Jin Nyodo Kinko style under Keisuki Zenyoji, Chikumeisha Kinko under Christopher Blasdel (Goro Yamaguchi), contemporary techniques with Akikazu Nakamura (Katsuya Yokoyama, Berklee College), Taizan Ha Myoan with Nancy Beckman (Fukumoto Kansai Kyoan,Yoshimura sôshin Fuan). He also studied the Chikuho notation system with Riley Lee. Perry has been studying with Ralph Samuelson since returning to the States in 2003 and continues to share the shakuhachi on the theatrical stage, film and television. Biography: One interesting aspect of jinashi shakuhachi is that it doesn’t always come out as you intended. Due to the depth of each single note, the delicate and manifold expressions in konten honkyoku, the jinashi shakuhachi is a just like a mandala of sound. I walk on this way by visiting the bamboo all night by enquiring and listening to what the bamboo tells me. I take each step while befriending the bamboo. Biography: Ricardo Zapata was born in Cartagena de Indias in 1974. He has a martial arts master titled of Shidoshi (Warrior and Master of the Way) and is a fully licensed teacher trained in the arts of Bujinkan, the official Japanese organisation of the Grand Master Masaaki Hatsumi. Zapata is the author of the book Ninja, Blade under Heart published in USA in two languages in the year 2008. The book is dedicated to his experience in the martial arts and the philosophy of life. He is specialist in educational management, a professional musician, graphic designer, artist and shakuhachi craftsman and the director of the school of martial arts Shinken Dojo, where he teaches the art of Shakuhachi (Zen flute) to his students. He led the first workshop ‘Introduction to Shakuhachi’ in Bogota D.C. Colombia in 2015 at the Soto Zen School and Zen community in Colombia. Additionally he gives courses for study in martial arts, meditation and music in Cartagena and nationwide through his School of Divine Sword. 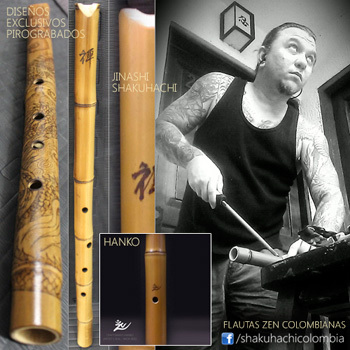 Master Zapata creates a colombian zen flute version, made with selected local bamboo, for playing the original songs of the komuso monks (honkyoku) or popular music (gaikyoku) with a beautiful and very professional sound and gives the possibility of access to people who love this instrument and the zen music.